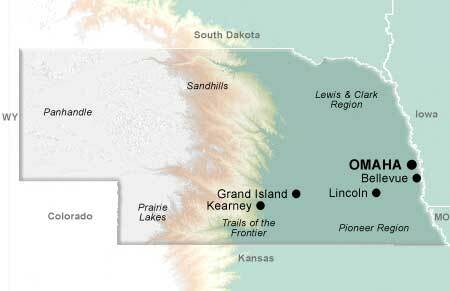 The Platte River Valley forms a natural east-west highway through the state of Nebraska, which the Oregon Trail, the Mormon Trail, and the California Trail all follow. The Platte is an unusual river, which westward-bound pioneers often described as "a mile wide and an inch deep", and "too thick to drink, too thin to plow"; Nebraska's planar flatness and imperceptible tilt give it little motivation to rush along -- except when a spring thunderstorm causes an epic flood. A lot of Nebraska is flat and even, but that just makes its sky bigger and its geographical highlights stand out in greater relief. 19th-century Trail travelers marked the halfway point of their journey at Chimney Rock National Historic Site, a 325 foot spire of red sandstone that announces the transition from the Great Plains to the Rocky Mountains. The sheer cliffs of Scotts Bluff National Monument inspired awe but also trepidation, as the narrowness of the pass meant vulnerability to attack by Native Americans alarmed at the accelerating encroachment of Euro-American settlers. After examining some of the excellent museums and monuments documenting the history of the Trails and the Old West, modern travelers craving solitude may want to wander north of the Platte, to the desolate Sandhills Region. Those after more social entertainment may wish to visit Omaha or Lincoln, especially if there's a rodeo going on, but nearly all of Nebraska's small towns offers a diner, a bar, an inn, or some other gathering spot where great conversation can be found. No matter what, make sure you say hello to as many Nebraskans as you can, because the stark beauty of Nebraska's landscape is complemented by the welcoming warmth and friendly demeanor of its people.